Glad to hear you got it going good! If it ain't one thing its another! My father laughs at me when I p*ss and moan about doing repair after repair, he says, "That's the joys of owning a hot rod", Unfortunately for him he can't maneuver around his car so well and calls on me to fix it for him. That's when I laugh and tell him "That's the joys of getting old", then of course I help him fix the car! I just wish right now some of my repairs were a lot simpler than what I'm dealing with. But I'll never stop! I love my cars too much! yup, now did anyone ever replace there upper rad hose? i have the flex one and hate it, id rather have the rubber one but the chinatown man at autozone said they cant carry it, i know thats a lie, but can i get one from a mali or camaro? I think mine is from a truck. Im sure you can find one to fit regardless of what it goes to. Also if you can't get one to line up perfectly to your gooseneck on the intake you can buy those that swivel! I always paint my aluminum intakes so any oil (or grease) that gets on it can be eaisly wiped off. Bare aluminum will stain. (Although brake parts cleaner will remove stains from bare aluminum) however is not kind to surrounding paint. Just a suggestion. yeah i painted my last one black, and turned out great, may do the same with this, but I still need to figure out if i wanna gears (373) or do my cam first. Welcome to the site possumface. Good luck with the 'guna. There's a guy here in town with 4 of them. A 74 big block 4spd. car, a 75 and two 76's. 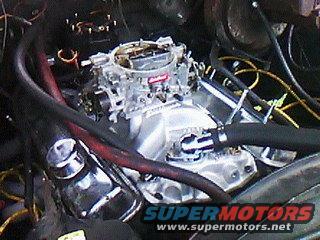 new intake is in but my stock Q jet wont fit it, so would anyone have a spare 650-700 edelbrock carb? 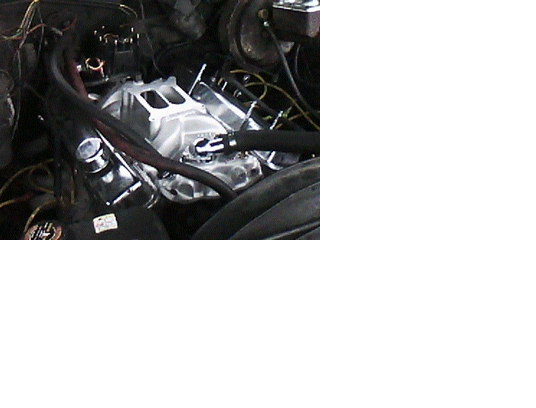 I have a Holley 650, double pumper, MECHANICAL secondaries that I took off my chevelle this past January. Its for sale. But its mechanical secondaries. No choke. I never run a choke. well i picked up a edelbrock 650 for 20 bucks yesterday and ran great! 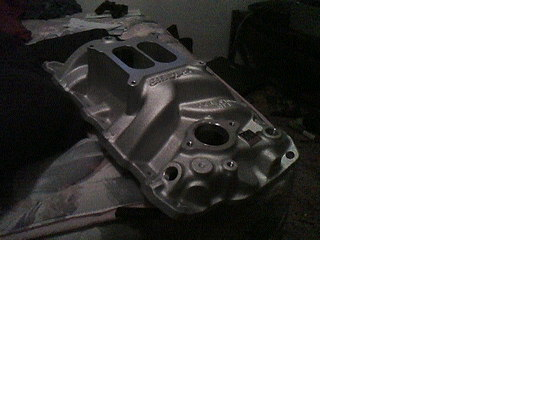 here is the final shot of the engine work, next i think im going to do my gears 3.73!! 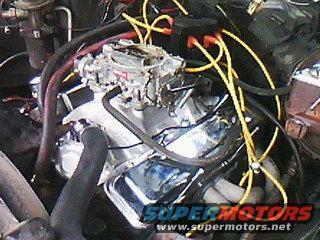 thanks after putting that carb on it its opened up so many horses and finally runs like a bat out of hell, lol. but they guy i got it from has a 70's camaro dash everything wiring and gauges for 100 bucks, i think i may get that also. at least see if it will work. My mom has a '76 camaro. I never even thought of trying something like that. It would be very unique if you can pull it off. my only thing is how would i get the whipers to work? and the lights? Try googling "gm part # 333882" there are lots of links to different forums where others have asked the same question. Most of what I read said they are so so heads. 882's are decent heads, 76cc, 1.94 intake, 1.50 exhaust valves. They came stock on my 73 SS. If your looking for some more performance and have to remove the heads anyway, I'd put on some 305 heads. They have smaller chambers and will raise your compression ratio for more performance. If you go the 305 route (that's what I have) try to find #416 h/o heads. They were made from '80 to '85. After I put them on my mild build 350 it turned the car into a tire fryer. I have a set of 882's on my 350. I had 2.02/1.60 valves, ported and polished the ports, screw in studs and guideplates. I did this before aluminum became the norm. My friend owned a cylinder head shop and really did these heads up right for me. I have over 10 years on them since first did work to them, now I just have the valves and seats freshened up whenever I change engines. To me they have been great, and I love the power increase they gave me. I'll keep these as long as I don't crack them. Most 2.02 head or "camelhumps" don't have the holes on the sides of the heads for the alternator or a/c brackets. ah thanks guys its nice to still learn, but ill get some pics soon, everything is running 100% better i think i may work on breaks next, nothing crazy maybe do ceramic pads and new m/c. sense brake fluid "disapears"
» Giant lego man washes ashore in Florida, baffles residents. » Please Help! Is there judo club in Florida State University?